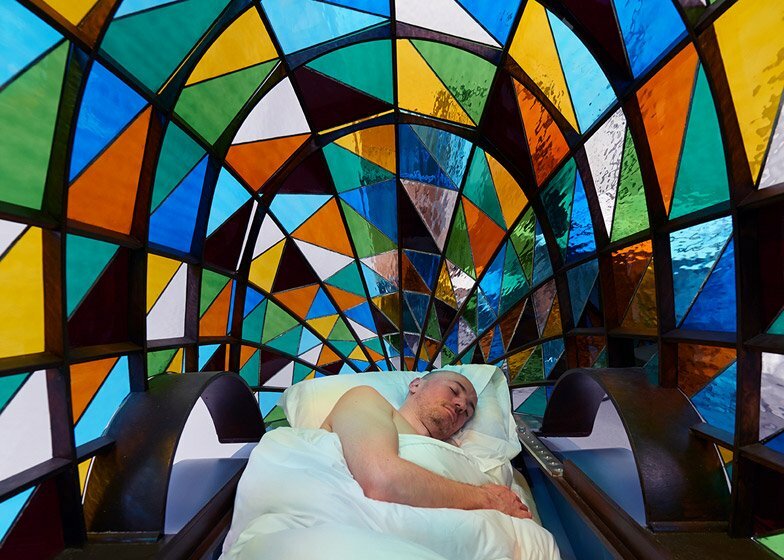 London Design Festival 2014: London designer Dominic Wilcox has unveiled a life-size concept car design for a future where driverless technologies make the roads safe enough to drive vehicles made of glass (+ slideshow). 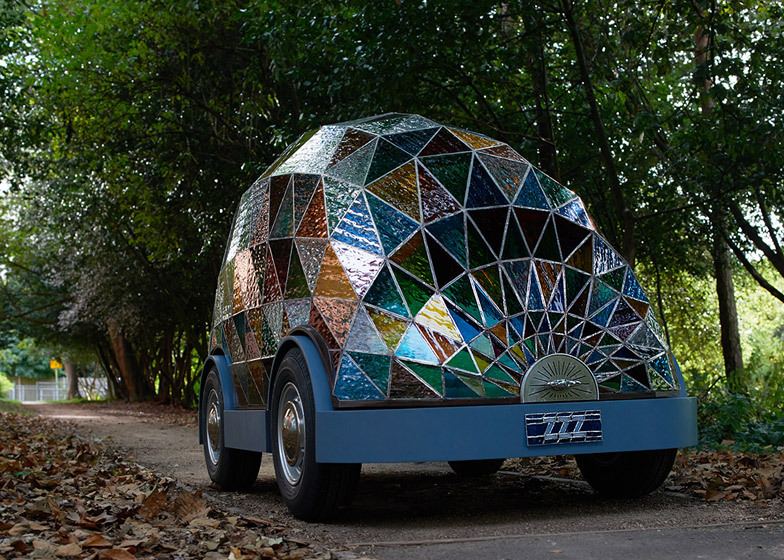 Wilcox created the car, called Stained-glass Driverless Sleeper Car of the Future, as a commission for a Dezeen and MINI Frontiers exhibition on the future of mobility, which opened today as part of the London Design Festival. 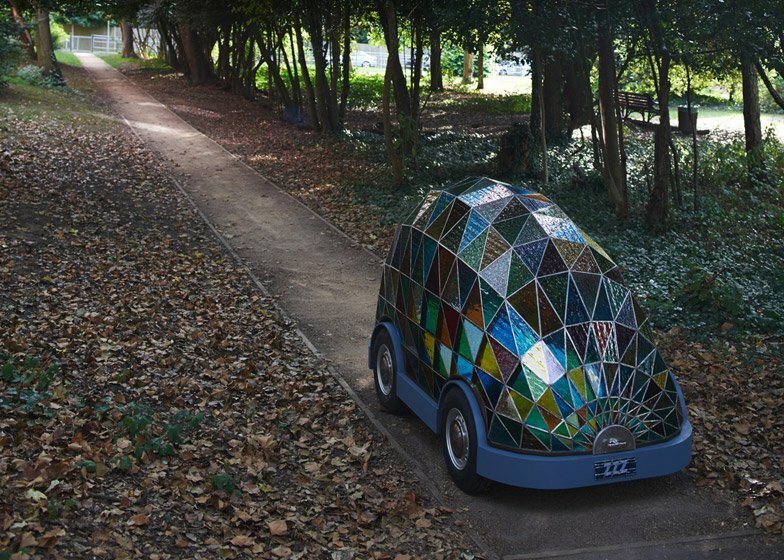 The designer imagined a future where all cars were controlled by computers that would eliminate collisions and accidents, meaning everyday vehicles would no longer need to be designed for safety. "In the future it will be safer to drive in a driverless car than it will in a manual car," said Wilcox. "Therefore we don't need the protection systems that are built into contemporary cars. We can just have a shell of any design." 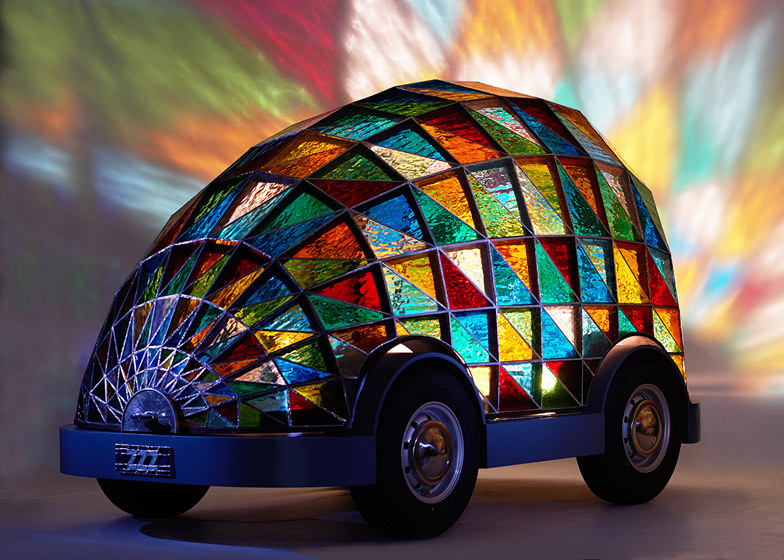 Made from coloured panels of glass, the pod-like shape of the vehicle was created using a wooden frame made from arches formed using a computer numerically controlled cutting machine that were attached to a flat base. 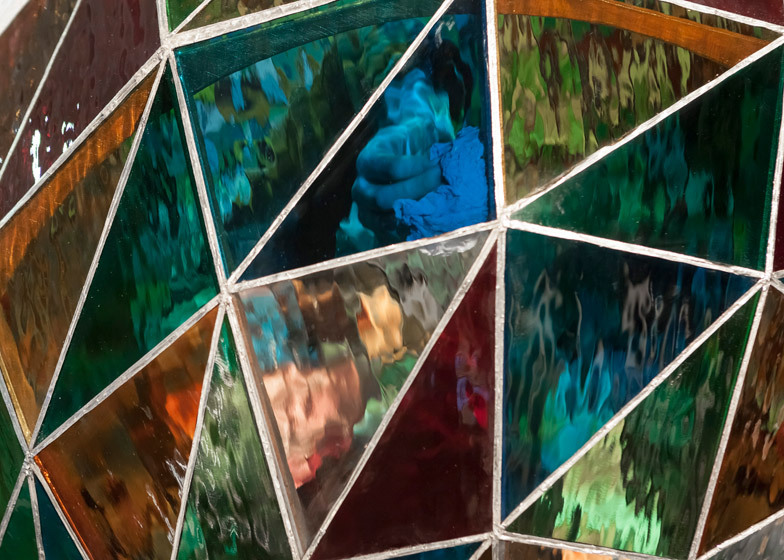 The glass was attached using a method known as the copper foil technique, which involves wrapping the edge of each piece in copper tape and soldering them together where they touch each other. 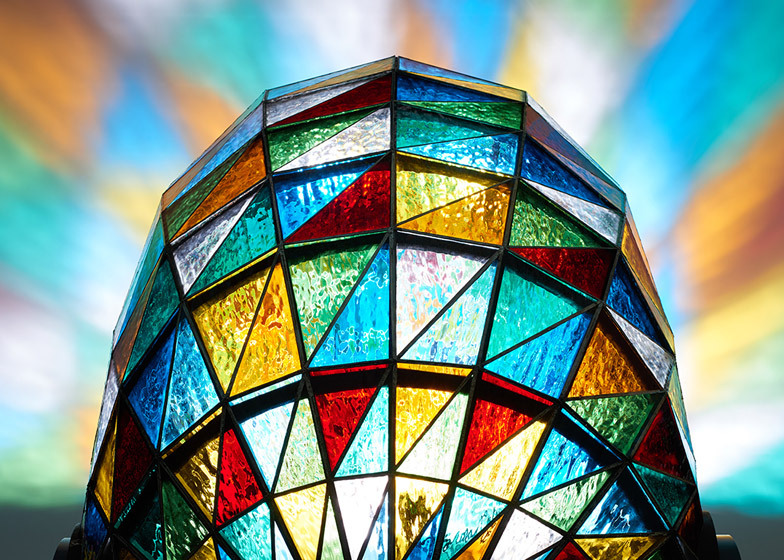 Opening from the front, the entire stained glass dome pivots on a hinge at the rear. Inside, there are none of the usual controls of a car – instead Wilcox imagines it would be operated remotely by a computer, in a similar fashion to Google's driverless car. Removing the controls frees the space inside for a number of functions. 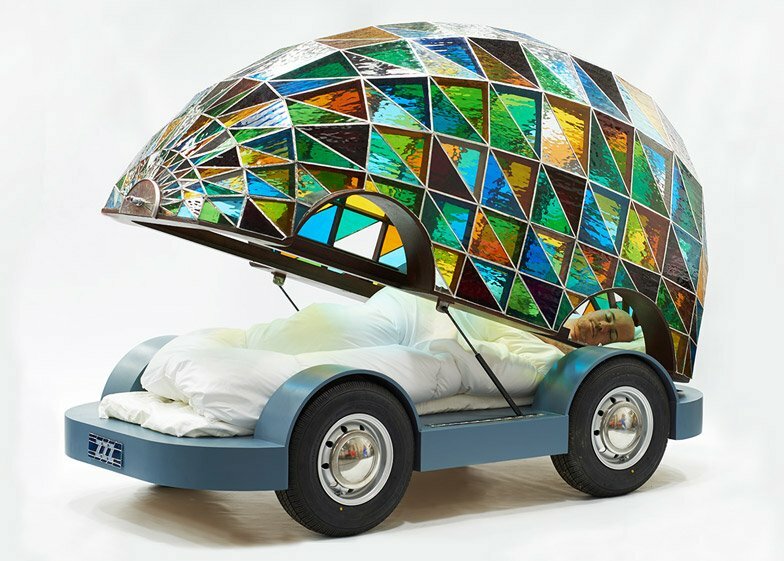 For this design Wilcox added a bed to create a "sleeper car". He has also launched a concept website called taxirobot.co.uk, where users can order cars with a number of different functions including a bedroom, mobile office, gym, a dining car and a sun bed car that could be programmed to avoid routes with more cloud cover. The website suggests a number of different possible designs for the exterior of the vehicle as well as offering a flexible time and date selection service for pick up. 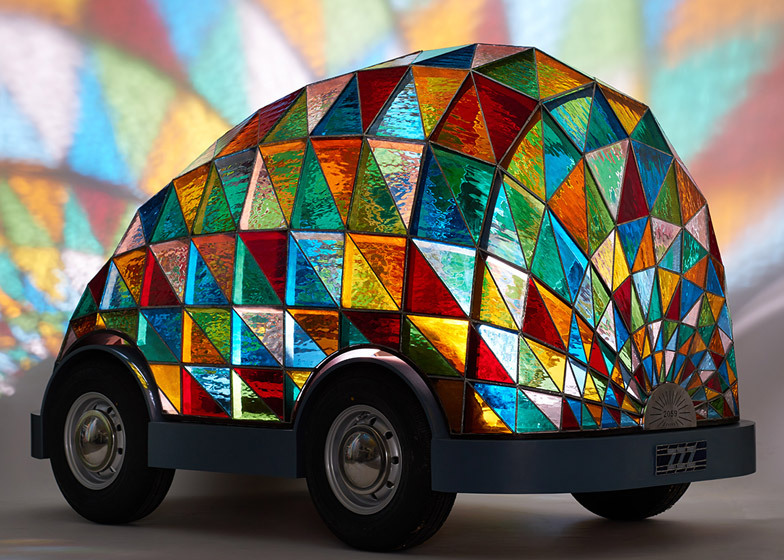 The car will be on display at designjunction, The Sorting Office, 21-31 New Oxford Street, London WC1A 1BA, until 21 September. Photography is by Sylvain Deleu.